What Are the Benefits of Hatha Yoga Poses? Read More: What is Hatha Yoga? Many Hatha poses improve your core strength — that's the center of your body, consisting of the spine, abs and hips. A strong core keeps you functional and wards off injury; it also improves your performance in sports and fitness. Poses such as Boat, Plank and Downward-Facing Dog strengthen your external obliques; Chair and Warrior I target your buttocks; and Chair and the Half-Lift improve the strength in your paraspinals, which are the muscles surrounding your spine and assist when you twist and bend. When you don't work your joints to their full range of motion, they tend to stiffen up and limit your movement. Hatha yoga poses work your joints in multiple directions, thus improving your mobility and flexibility. 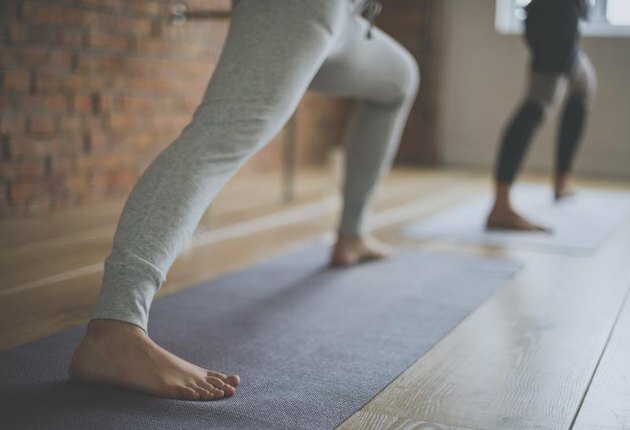 A study in the Journal of Physical Therapy Sciences from 2015 found that just one 90-minute yoga session per week greatly improved mobility in the joints, especially the spine, of women aged 50 to 70 years. Hatha yoga poses can improve your ability to know where you are in space — that's your balance and proprioception. Good balance keeps you from being klutzy and potentially falling and hurting yourself when you encounter an icy street or change in terrain. You also stand taller and look more confident as balance and proprioception impact your posture.